If you feel like satisfying your urge for craftsmanship, or are sick of the uniformity of malls, go check out the stuff–dresses, jewelry, handbags–at Taylor De Cordoba. Taylor De Cordoba is Heather Taylor’s sweet little contemporary art gallery in Culver City. They don’t normally sell clothes and accessories (and the art usually appears on the walls). But they’re doing a month-long summer project called L.A. Fashion Bloom (until August 8). 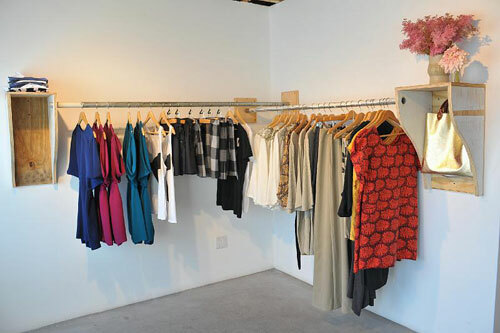 Influential curator and gallerist Heather Taylor has transformed her gallery into a temporary fashion boutique. I love that the current economic climate has encouraged an informal attitude to bridge the gap between art and fashion. Anything goes and people are enjoying that. Up through August 8, they are featuring the work of five LA-based designers – Clare Vivier, Annie Costello Brown, Gregory Parkinson, Jesse Kamm and Wren. A portion of all proceeds go to P.S. Arts, a local non-profit dedicated to restoring the arts in public schools. For a limited time only (like, about a month), the Taylor De Cordoba art gallery in Culver City is housing wearable art pieces. The most buzzed about LA-based designers Clare Vivier, Wren, Gregory Parkinson, Jesse Kamm and Annie Costello Brown are offering their wares through August 8 at Taylor De Cordoba, a contemporary art gallery in Culver City. On our wishlist: metallic leather tote bags by Clare Vivier, Annie Costello Brown’s outfit-making long fringe necklaces and Wren’s gem-hued short silk dresses. A portion of the proceeds will benefit P.S. Arts. Thursday night Christina (who also took these lovely photos) and I hit up Taylor De Cordoba (2660 South La Cienega Boulevard, Culver City) for the opening night of LA Fashion Bloom – a pop-up boutique the gallery is hosting through Saturday, August 8. Paintings and sketches have given way to handbags and dresses at La Cienega’s Taylor de Cordoba gallery, which has been temporarily transformed into a cozy boutique dubbed LA Fashion Bloom. Until August 8, new and archive pieces from five of LA’s most esteemed labels – Wren, Jesse Kamm, Gregory Parkinson, Annie Costello Brown and Vivier – will be up for grabs, with a portion of proceeds going to arts education charity P.S. Arts. All items will be available for purchase and a portion of proceeds will be donated to P.S. Arts, a local organization dedicated to restoring arts education in public schools. The designers will be featuring pieces from previous seasons in addition to debuting new fall items. Some of L.A.’s most sought after design talent will transform the space from gallery into boutique. Local artist and Reorganica designer, Tony Brown, has created reclaimed wood store fixtures. Vintage lighting and accessories are courtesy Empric with floral landscaping designed by Holly Flora. L.A. FASHION BLOOM will exist for one month. 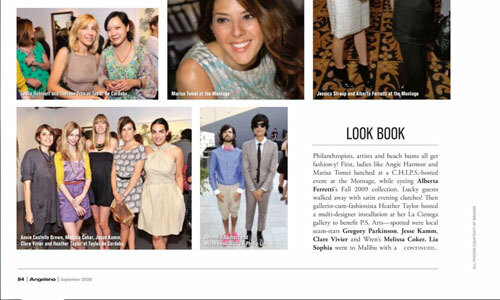 The gallery is delighted to be hosting a fashion week event for Echo-Park based designer Clare Vivier. 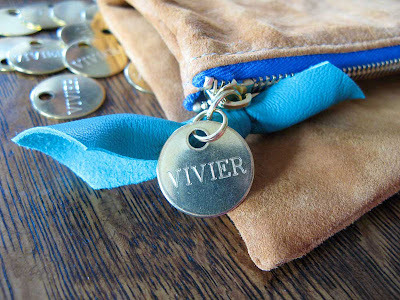 Ms. Vivier will be presenting her Spring/Summer ’09 collection of handbags for her line VIVIER. A percentage of the proceeds from all handbag sales and art sales will be donated to P.S. Arts, a local non-profit dedicated to restoring the arts in public schools in and around Los Angeles. To get YOUR invitation for tonight’s event click HERE.